“It’s not fair!” Sheryl Yoast screams at the top of her indignant 10-year-old lungs. Bill Yoast tries to assuage his incensed young daughter, but she storms off with a scowl; though not before giving a swift kick to the shin of the well-dressed athletic director tasked with delivering the news. “Boycott T. C.! Boycott the school!” shouts a voice from the crowd. “Coach, I’m out, too,” says another. With the grace of a defeated yet not dishonored general, he bends the knees for the sake of his team and accepts a role as the defensive coordinator under Coach Boone. “It’s the world we live in,” laments the school’s athletic director. I am, admittedly, a Bernie Sanders supporter. I wrote what was essentially an official endorsement of the guy all the way back in June; I’ve spent more than a few hours of my life cold-calling, conversing with, and debating random strangers as part of official and unofficial Bernie Sanders phone banks; I tell everyone I know that Sanders wallops both Trump and Cruz in hypothetical matchups, polling better than Clinton in both cases. I want Bernie Sanders to win. Follow the math – which Harry Enten of FiveThirtyEight would love to explain to you – and look at what would have to conceivably happen for Bernie to catch Hillary (for starters, here’s an explanation on how super delegates work). It’s a depressing, infuriating reality, but it’s damn near impossible statistically very unlikely Bernie Sanders ends up being the 2016 Democratic nominee. Nonetheless, I will continue to phone bank and donate and Feel the Bern all the way up until Bernie is able to wrangle an official change in the Democratic party platform # and give what I know will be an historic speech at the convention in July. “Hillary Clinton is not going to win the Democratic nomination because she has a better message than Bernie Sanders, and it’s certainly not because Bernie Sanders’s social-democratic policies somehow don’t connect with women or African Americans, or all the crap you see Hillary supporters putting out. It’s an obviously biased take on an extremely complex election, but if you’re a recently-converted “democratic socialist” it’s probably not far off from how you feel when confronted with the deluge of stories and polls preemptively proclaiming Hillary victorious. “In a few months, when we have that race, in all likelihood between Hillary Clinton and a loathsome Republican, and you don’t support Hillary Clinton, you’re going to be accused of supporting Trump because that’s the logic of lesser-evilism. You’re going to be accused of not caring about Planned Parenthood. It doesn’t matter if you were one of the people who were at the protest against Donald Trump last night at Columbus Circle, or you’re one of the people who helped organize that protest. You’re going to be accused of not caring about the consequences of Donald Trump, and you’ll be accused of that by some people whose only response to Donald Trump is to say, ‘Oh, Trump is terrible, send more money to my campaign’ which is basically what Hillary Clinton is saying about Donald Trump after being friends with him for twenty years. And unfortunately, in a few months Bernie Sanders and most of the upper-level organizers in his campaign are going to tell their supporters that they need to now get behind Hillary Clinton to prevent that horrible Republican victory. And the pressure on the people who think we need to build something independent of that is going to be enormous. He is right about a few things, though. Because when we do have that general election race, in all likelihood between Hillary Clinton and a loathsome Republican Donald Trump, you will be supporting Trump if you don’t vote for Hillary Clinton, thanks to the logic of “lesser-evilism.” You will be accused of not caring about Planned Parenthood, and you will be blamed if Donald Trump is the person nominating our Supreme Court vacancies. Bernie and most of the upper-level organizers in his campaign are going to tell their supporters they need to get behind Hillary Clinton to prevent that horrible Republican victory, but that’s because their supporters actually need to get behind Hillary Clinton to prevent that horrible Republican victory! 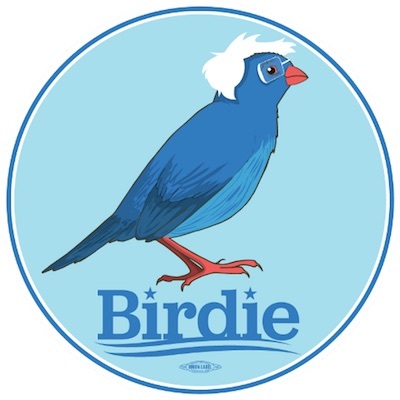 The Sanders campaign has already had to deal with the Bernie Bro phenomenon – their own version of Trumpers – whose actions they have had to repeatedly apologize for and denounce # . Still, a more damaging faction of their constituents might be those rallying around the “Bernie or Bust” slogan, who say they will sit out a general election or support Jill Stein (the leading recognized candidate in the Green Party). In a recent WSJ/NBC poll, 33% of Sanders voters said they wouldn’t vote for Clinton, and while that is just one poll taken at a vulnerable time in the campaign process, it is disconcerting that more than 60,000 people have already signed a #BernieOrBust pledge. And especially when Sanders and Clinton ultimately mostly agree on big policy questions. Watch any debate and you’ll hear both candidates hammer home the point that while they have their differences in opinion, they are ideologically worlds apart from their counterparts in the GOP. “The differences between Sanders and Clinton on policy just aren’t very great, and they get blown out of proportion in a primary contest,” Alan Abramowitz, a political science professor at Emory University, recently told Vox’s Jeff Stein.
.@BernieSanders: "Hillary Clinton and I agree that it is absolutely imperative that no Republican make it to the Oval Office." Now, I may be a mean cuss, but I’m the same mean cuss with everybody, so pardon my french when I say that these “Bernie Or Bust” loyalists are coming off like a bunch of fifth-grade sissies after a cat fight when they say they’d rather stay home than vote for Clinton. Democracy is about controlling that anger, harnessing that aggression into a team effort to achieve perfection. If we Democrats don’t come together in July, on the hallowed ground of the Wells Fargo Center in Philadelphia, we will be destroyed. So I don’t care if you Berners and you Standing With Her don’t like each other, but you will respect each other. The GOP, like Hayfield High School in 1971 # , doesn’t have to worry about such complex, electorate-splitting as race (and gender equality, and immigration reform, and voter rights, and gun control, and…,). We as liberals do. But, like the Titans of T.C. Williams, we are ultimately better for it. The modern Democratic Party has always juggled progressive aspirations with the limiting binds of practicality, confident there is, after hard work and compromise, no mountain high enough or valley low enough to stop us from moving forward; sometimes in Bernie-esque bursts, sometimes in Clinton-like increments. Sure Hillary may seem like she’s only one game-clinging primary win away from pulling a “Who’s your daddy? And whose team is this? Is this your team, or is this your daddy’s team?” # , but as Sanders continues to demonstrate he, indeed, has soul power and Clinton continues to demonstrate she’s in fact too strong, there will be a moment in the next few months when both candidates must stop slapping each other’s shoulder pads # and face the same direction before the ball is snapped. When that happens, we liberals will make Donald Trump remember the day he took on the Democrats. Feel the Bern, but remember the Titans.